'Big Bad World' is a new comedy series starring Blake Harrison as Ben, a graduate who moves back to his hometown in Great Yarmouth hoping to have the world bow down to him. However, Ben quickly has to deal the harsh truth - with no job, no girlfriend and still living at home Ben starts to realise that having a degree is not everything. Ben has difficulties adjusting back to his old life, now that his parents (Caroline Quentin and James Fleet) smashed down his wall so they are all sleeping in one big room. With no top businesses wanting to hire Ben without experience, he is forced to finding a dead end job in Great Yarmouth. Plus his odd flame Lucy (Scarlett Johnson) has now moved on which is a hard pill for Ben to swallow. The only good thing for Ben is that he is back with his old group of friends - Beth (Rebecca Humphries) the know-it all, Eggman (Seann Walsh) the broke guitarist, and Oakley (David Fynn) your typical lad of the town. I have to give credit to one of the small characters Dean played by Jay Brown who is that lad that terrorised you in your school days. And continues during your adult life. As much I find his character quite dumb, I just cannot help but to laugh whenever he is on screen, I hope if 'Big Bad World' is given a second series he is given more of a chance to shine. Comedy Central did a real good job with advertising 'Big Bad World' - I could not escape without seeing Blake Harrison’s face somewhere. Whether or not this show will be renewed will decide on many factors. Harrison’s commitment will be a main factor, with the new 'Inbetweeners' film apparently being released next year, I find it hard to see Harrison devoting time to 'Big Bad World' but I would love to be proven wrong. My other concern is how long can we see Ben play this loser in life type character before the material starting to run dry. I really hope the creators Joe Tucker and Lloyd Woolf would know when to pull the plug on show. Catch 'Big Bad World' every Wednesday at 10pm on Comedy Central. I love myself a good piece of fried chicken, and it appears many other people do too. 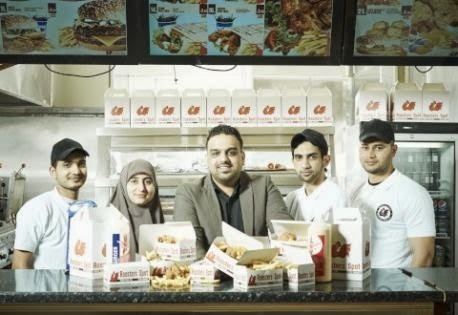 After the success of the one-off documentary last year, Channel 4 has decided to bring back 'The Fried Chicken Shop' for a three part series. Set in a chicken shop called the Rooster Spot in Clapham, South London, we are given an insight into the people that work in the shop as well as the people that come in day by day. Even writing about this show brings a smile to my face, just thinking about some of the random people that enter 'The Fried Chicken Shop'. One of these strange humans is the transgendered Jesse, who loves to give out fashion advice, frowning upon colours such as black and white. After dating a range of girls that supposedly dressed dull, Jesse decides that she can do better than her ex-girlfriends - transforming herself into a right mess, if I may say. Like with any takeaway shop, you can get people that are willing to start trouble after having a few too many. The most cringeworthy part is when you see people from your old high school starting trouble against someone dressed in a Captain Jack Sparrow outfit. I refuse to spoil it but let's say many of us have seen these types of incidents happen at the end of a night out. As much the people that come into 'The Fried Chicken Shop' are pure entertainment you have to admire the workers who are able to keep such a straight face as these drunk and slightly crazy people make conversation with them. These workers generally love their job and the people that come into the shop seem to bring a sense of joy to them. At the end of the day, 'The Fried Chicken Shop' is a show that allows you to have a laugh at some very crazy people. People may argue that we are exposing these people to humiliation but I am sure that there were other fried chicken shops without cameras nearby. I hope Channel 4 do not over expose these people, like how they have gone overboard with the 'Big Fat Gypsy' shows. After writing about all this fried chicken, all I want to do is grab some chicken but I'll resist. For now. Catch 'The Fried Chicken Shop' every Monday at 9pm or catch up on 4oD. Read more Telly Text columns here, and find Jordan at Twitter.